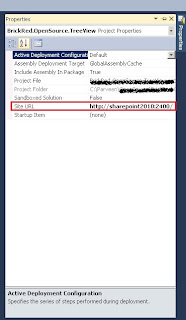 TechPerspect Blog: Error occurs while deploying SharePoint solution through Visual Studio 2010 - Error occurred in deployment step 'Recycle IIS Application Pool': Cannot connect to the SharePoint site. 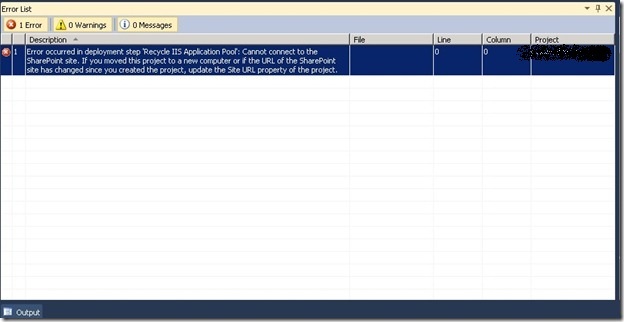 Error occurs while deploying SharePoint solution through Visual Studio 2010 - Error occurred in deployment step 'Recycle IIS Application Pool': Cannot connect to the SharePoint site. Error occurred in deployment step 'Recycle IIS Application Pool': Cannot connect to the SharePoint site. 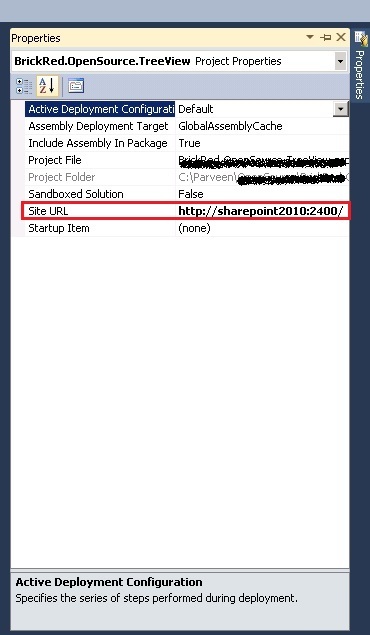 If you moved this project to a new computer or if the URL of the SharePoint site has changed since you created the project, update the Site URL property of the project. This is because we forgot to mention the Site URL where we are going to deploy our solution. 1. Select the Visual Studio project from the "Solution Explorer" toolbox and then open the property toolbox. Take care to open the property toolbox (visible in figure) and NOT the project property using a right click of the mouse. 2. Over there you will find a property called "Site URL", which must be changed with the new address of your new SharePoint 2010 web application. After doing this, your deployment from Visual Studio 2010 will be smooth.